The warmer temps in Kansas City have all of us at Grin Eye Care excited for spring, but it seems that winter is still hanging on. One of the most common issues during these cold winter months is dryness. Take a look at these 10 tips to combat dryness and to help keep your eyes feeling happy and healthy. HUMIDIFY YOUR HOME: Add some moisture back into the dry air by running a humidifier. CHOOSE THE RIGHT EYE DROPS: Using artificial tears 3-4 times per day is a great way to keep your eyes lubricated. Brands like Systane, Refresh, Soothe and Blink are great options. Be sure to stay away from drops that claim redness relief (for example, Visine) because they are more irritating. Our doctors can recommend the best eye drop for you and we are happy to answer any questions you may have over the phone. TAKE A BREAK: If you are one of the millions of people who spend your day on the computer, make sure you are taking frequent breaks from staring at the screen. Digital Eye Strain is a major culprit of dry eye. Follow the 20-20-20 rule: look away from your screen every 20 minutes for at least 20 seconds at something 20 feet away. Check out our blog post about Digital Eye Strain for more information. UP YOUR INTAKE OF OMEGA-3 FATTY ACIDS: Omega-3 fatty acids help improve the quality of the tear film and the health of the oil glands found at the base of the eyelashes. Fish oil supplements and foods like salmon, eggs, spinach, walnuts and soybeans are high in Omega-3s. If you plan to take a supplement, be sure to ask our trusted eye doctors for the best brands. DRINK WATER: Staying hydrated is one of the best and easiest ways to keep your eyes and body well moisturized. Shoot for eight 8 oz glasses per day. CLEAN OUT YOUR MAKE UP: Replace your eye make up (especially mascara) and wash your make up brushes in order to avoid bacteria build up. An increase in bacteria can clog the oil glands and contribute to dryness. 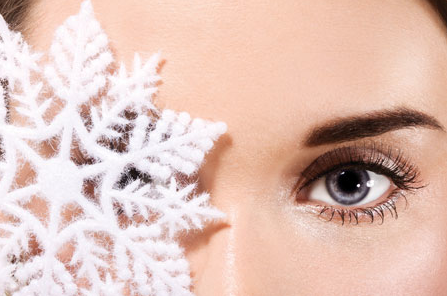 You may also want to avoid skin creams that contain retinol, another dry eye culprit. Be sure to remove your make up every night before going to sleep. Coconut oil is a great and natural make up remover alternative to the removers sold in stores. USE WARM COMPRESSES: A hot washcloth or warm beaded eye mask held over the eyes for 5 minutes is one of the best ways to open up the oil glands and keep your tear film nice and healthy. The oil layer of the tear film, secreted by glands at the base of the eyelashes, is important to keep the tears from evaporating too quickly. After applying the warm compress, use baby shampoo or lid scrubs to clean the lids and lashes. A healthy tear film is essential to keeping the eyes moisturized. PROTECT YOUR EYES: If you are going to be outside in the cold weather, protect your eyes from the wind and cold air by wearing 100% UV protective sunglasses. Stop by our optical shop for a great selection of frames, including the top selling brands. You should also direct your heat vents away from your face while driving because the hot air can dry out your eyes very quickly, causing excessive watering, dryness and discomfort. SPEND LESS TIME IN YOUR CONTACTS: Contact lens overwear is notorious for making dry eyes worse. Give your eyes a break and wear your glasses a little more often during these dry winter months. As always, avoid sleeping in your contact lenses and always replace them according to the schedule recommended by your eye doctor. MAKE AN APPOINTMENT WITH ONE OF OUR DOCTORS: There are many factors that can contribute to dryness and our trusted doctors are here to examine, treat and manage all different levels and types of dry eye. The National Institute of Health estimates that over 4 million people have from dry eye disease. Dry Eye Disease is a medical diagnosis and there are many different treatment options available. Call us today to make an appointment and to find relief if you are one of the millions of people who suffer from dry eye.